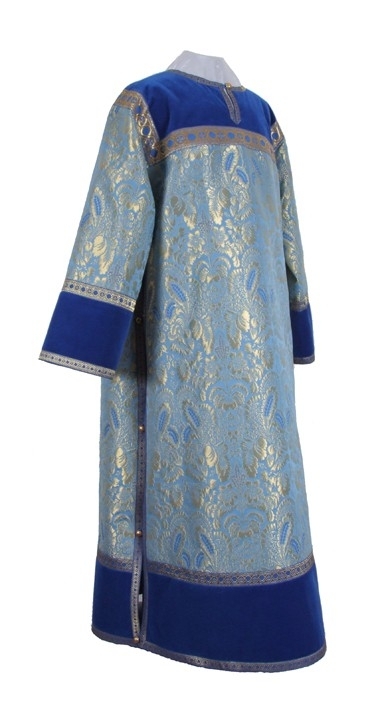 Orthodox Church liturgical Clergy stikharions (albs) (blue-gold) by Istok Church Supplies Corp.
Finding the right clergy sticharion in the right color combination and at the right price can be overwhelming if you limit yourself to a geographical area. Istok Church Supplies brings to you the convenience of online shopping and offers a stunning range of clergy sticharions (blue-gold) at pocket friendly prices. Our liturgical clergy sticharions (blue-gold) are different from the street clothing worn by clergy members. Grand and dazzling, they signify the purity of soul that is essential for a person of clergy rank to carry out important church services. Blue and gold is a traditional color combination and most suitable for celebrating feasts and days dedicated to the Most Holy Theotokos. We wish to support all Orthodox Christian communities with their diverse requirements and budgets. Customers can select vestments made from a wide variety of quality liturgical fabrics including rayon brocade, metallic brocade and natural German velvet. Patrons who would like a specific fabric belonging to the same class as that mentioned for a product can make a request in the Notes section during check out. All our clergy sticharions (blue-gold) are lined with natural rayon and customers can add natural velvet inserts to their order for an additional cost. Decorations make our sticharions even more striking. Decoration includes galloon and crosses and for this, we offer three options – economy, standard and premium. Our clergy sticharion are in the traditional style and have open sides as is the norm for tonsured persons. To help customers make informed decisions, we provide images of the product that can be zoomed into as well as important information such as weight and care instructions. All our clergy sticharions can be made-to-measure and patrons are requested to send us their exact measurements as per our online chart, so our liturgical tailors in Europe can construct perfectly fitting clergy sticharions with quality workmanship. Browse our full line and discover exquisite clergy sticharions at unbeatable prices!